Daniel Mahiai landed his 101-lb giant trevally while using a 13-foot Sabre pole, Penn 6/0 reel and 80-lb test Cajun line. He was fishing during the 2008 Labor Day weekend and was entered in a tournament. On that trip, Daniel's group scored three fish. 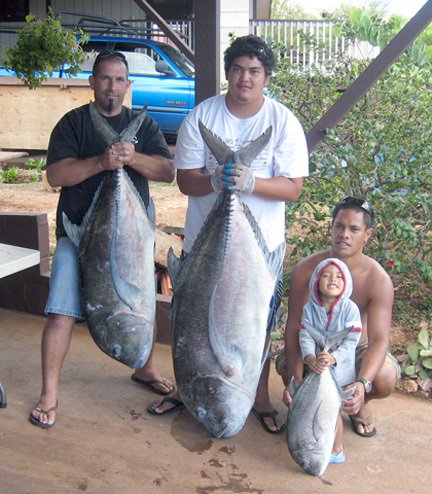 Pictured left to right is Greg with a 57-pounder; Scott holding the 101-pounder, and Daniel and his son Kealomahina with a 10-pounder.